Delta Air Lines serves more than 180 million customers each year. In 2017, Delta was named to Fortune’s top 50 Most Admired Companies in addition to being named the most admired airline for the sixth time in seven years. Fast Company also named Delta among its most innovative companies in 2018. With an industry-leading global network, Delta and the Delta Connection carriers offer service to 314 destinations in 54 countries on six continents. Headquartered in Atlanta, Delta employs more than 80,000 employees worldwide and operates a mainline fleet of more than 800 aircraft. 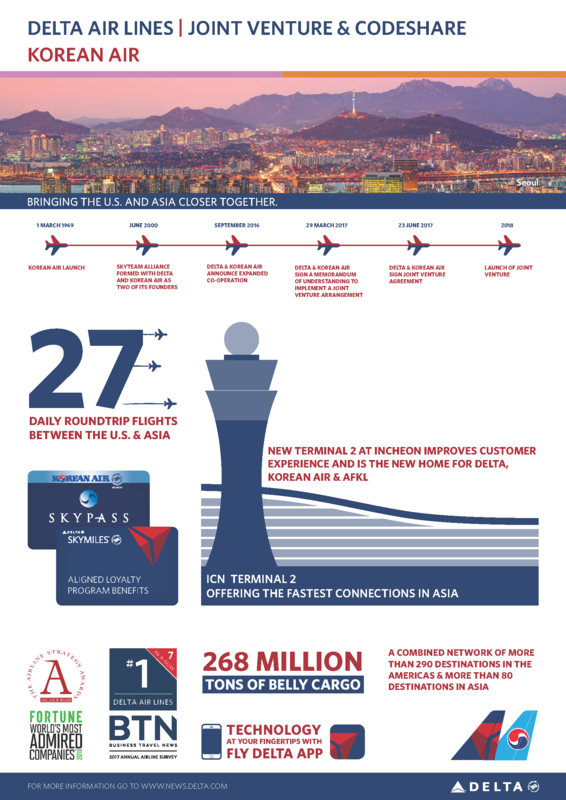 Including its worldwide alliance partners, Delta offers customers more than 15,000 daily flights. Additional information is available on the Delta News Hub, as well as www.delta.com, Twitter @DeltaNewsHub, Google.com/+Delta, and Facebook.com/Delta.